In last week's episode of The People v. O.J. Simpson: American Crime Story, the trial's most famous moment was depicted. When Christopher Darden asked Simpson to try on blood-stained gloves and they didn't fit, it was a massive blow to the prosecution's case. And, although it's impossible to know exactly what lead the jury to deliver a not guilty verdict, many view the gloves as the moment the state lost the case. But, they weren't the only piece of physical evidence that was presented — the jury saw other blood and DNA evidence against O.J. Simpson. Until the gloves scene, American Crime Story had mainly focused on circumstantial evidence. For example, detectives noted that it raised red flags when Simpson received the phone call that his ex-wife was dead and he didn't inquire about the cause of death. Lead prosecutor Marcia Clark was furious that he hadn't been held accountable for his history of alleged domestic violence against Brown Simpson. But, prosecutors expected the bloody gloves to be their key to a guilty verdict — one was found at the Bundy crime scene and the other was found on Simpson's property. As reported by People, DNA from Simpson and both victims was on the gloves. 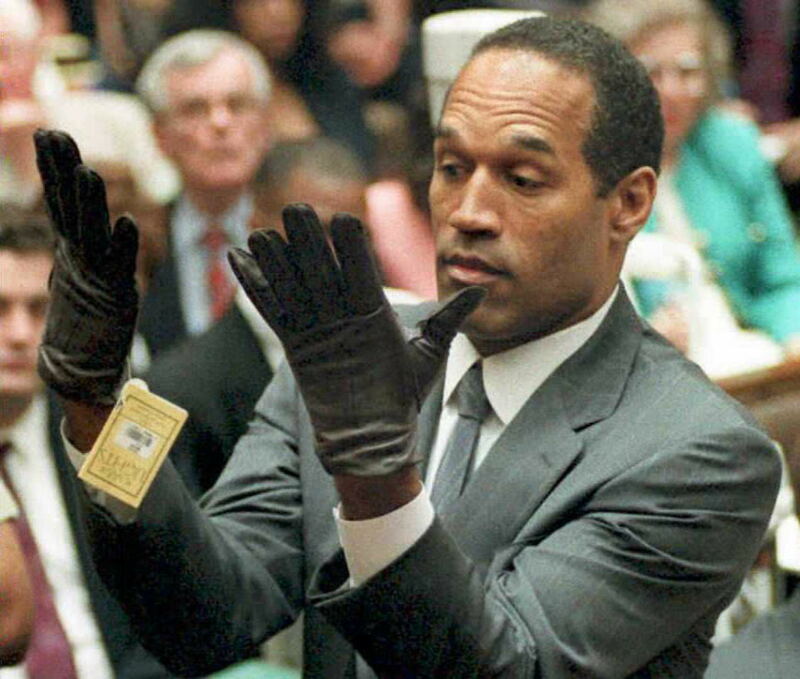 After Simpson tried on the gloves in court and they appeared to be too small, the prosecution argued that they "had been soaked in blood and subsequently frozen and unfrozen several times to be preserved." Gloves aside, here's a look at the other key pieces of physical evidence presented by the prosecution. Small spot of blood found near driver's outside door handle of Simpson's Ford Bronco; other blood found smeared inside on console, door, steering wheel and carpeting; DNA tests showed some of the blood apparently a mixture with genetic markers of Simpson and the victims. During Simpson's trial, the defense argued that police could have planted some of the blood and presented testimony that unauthorized people entered the Bronco while it was in the police impound yard. They also raised doubts about whether or not the blood was truly Goldman's and stated that "the genetic material of an unknown person" was present in the blood on the steering wheel. USA Today also reported that hairs "similar to" Simpson's were found in a cap at Brown Simpson's condo. The defense countered that the hairs only proved the defendant was black and also argued that evidence could have inadvertently been moved around the crime scene when a detective covered Brown Simpson's body with a blanket from her home. Fibers matching the Bronco's carpet were present on the glove found at Rockingham and on the cap found at the Bundy residence. In May 1995, forensic scientist Dr. Robin Cotton testified that blood found near the bodies of Brown Simpson and Goldman was a genetic match to Simpson's, as reported by The New York Times. USA Today also reported that drops of blood containing Simpson's genetic markers were found on a gate behind the Bundy condominium. When Simpson was interviewed by police the day after the murders, he had a cut on his finger. The defense countered that the DNA results were "unreliable," claiming that the samples were not collected correctly. They also reiterated their prior arguments that blood evidence had been planted by the LAPD in an effort to frame Simpson. In June 1995, The New York Times reported that an FBI expert testified the bloody footprints at Bundy were from a size 12 Bruno Magli shoe. Simpson wore a size 12. After the criminal trial, The Los Angeles Times reported that photographs of Simpson wearing Bruno Magli shoes had emerged and been published by The National Enquirer. The photos were authenticated and presented as evidence during the civil suit in which Simpson was found liable for the murders of Brown Simpson and Goldman. In January 1995, The New York Times quoted Marcia Clark as claiming that the "trail of blood from Bundy through his own Ford Bronco and into his house in Rockingham is devastating proof of [Simpson's] guilt" during opening arguments. According to The Associated Press, blood on a pair of socks found in Simpson's home contained the genetic markers of both he and Brown Simpson. Although the gloves weren't the only piece of physical evidence presented by the prosecution, the defense argued that blood evidence could have been planted elsewhere — and it raised enough reasonable doubt to secure an acquittal.